Pingpong balls dropped from the sky for prizes rank high among offbeat school fundraisers in the region. So does a $10-a-ticket raffle at some Coeur d’Alene schools for a chance to get a fully paid set of braces, including at Canfield Middle School with a drawing next week. Not bad if you end up paying $10 for a $5,000 treatment. Parent-teacher group leaders say the unusual or fun seems to draw more dollars these days to help pay for extracurricular events and school materials while direct sales for proceeds mostly have gone flat. Perhaps it’s another hit from online shopping or wary consumers in general. For the past two years at Canfield, that includes a pingpong drop in the spring. Kids sell balls for $5. A business donates a crane, and the principal – in costume – drops the balls over a small hole from 40 feet up. Small cash prizes go to the closest and farthest ball. “We made about $5,000 off that each year,” Hart said. Kids who sell 10 balls get out of class, earn a free snow cone and get to watch the drop. Canfield also holds the Smile raffle for braces – offered at other Coeur d’Alene schools, too. Hart said Curtis Orthodontics in Coeur d’Alene provides a chance for free braces, and schools just have to sell the tickets. “Really no work for us, other than to send tickets home with our kids, and they go sell them,” Hart said. “I think there were 10 or 11 schools in our district that ran it last year. I know we raised $7,000 off it. There were some schools that raised more. Other school groups have raised more by staging events, from themed auctions to walk-a-thons or fun runs. 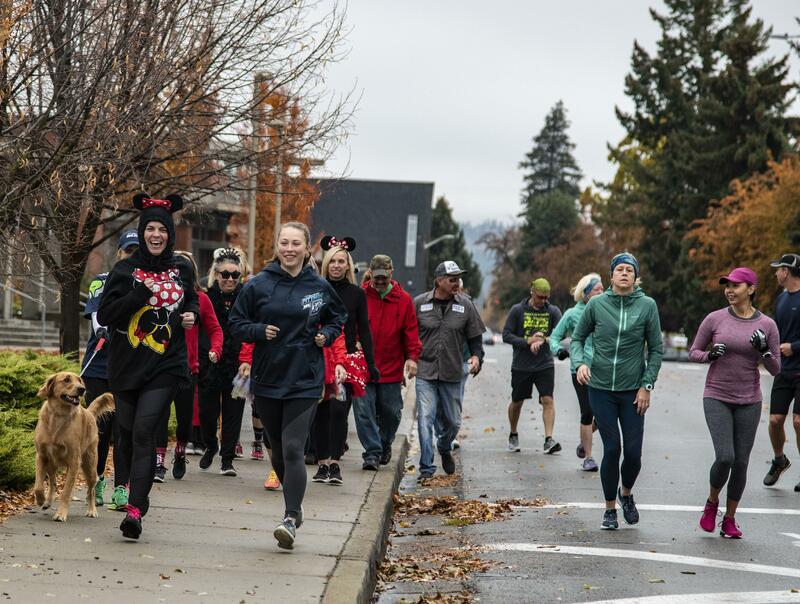 An Oct. 28 Halloween fun run made about $400 for the West Valley High School Senior All Nighter, said parent Zena Mortan. Last year’s run drew $2,000, but rain dampened turnout this time. The WVHS All-Nighter group has tried other new ideas, like hosting an August car show with an entry fee. It provided staff at the county fair to direct parking traffic with their pay going to the collection. The group also held a clothing and textile collection for Value Village raising $1,200 in August. Another drive is set for November. Seasonal pitches to sell flower baskets or poinsettias do OK, Mortan said, but other sales options were dropped. Kids and families are busy, she said. Some school organizers do find a way to help families purchase what they’d buy anyway. One of those approaches is through Scrip, a company that provides retailer gift cards, while a percentage of the dollar amount on each card goes to the school. About 750 retailers are among choices through the company Great Lakes Scrip such as Target, Starbucks and T.J. Maxx. Movie theaters and grocery chains are in the mix, as are a few smaller Spokane-only stores. “We work with Atticus during the Christmas season,” Storo said. Although time-consuming for organizers, auctions tend to do well, as do fun events with entry fees and themed activities. Wilson Elementary’s winter auction, held biennially, attracts eager bidders. Organizers have students collectively create “masterpieces” of art or furniture. The auction, which also has other donated silent auction items, is an adult-only evening and profits are in the “thousands,” she said. The group applies funds raised toward such categories as field trips, outdoor recess equipment and classroom learning enhancement. This is an “off” year, so the event won’t happen until next winter. Dix said planning is time-consuming, so the biennial basis gives organizers a break, although they hold three smaller events each year. They organize back-to-school pizza night, Monster Mash Halloween party and spring carnival with games. Those smaller events typically draw profits in the hundreds, she said, and are more about creating family fun. AmazonSmile offers a path for consumers to buy online from Amazon and designate that a percentage of eligible purchases go to a nonprofit, including a PTA group. Shoppers just have to remember to use smile.amazon.com when making purchases. Some schools offer parents the chance to simply write a check, with no selling, buying or volunteering required. Box Tops for Education is an ongoing program that General Mills started in 1996. Families clip the symbol from the containers of participating products and turn them into the school. Each eligible school may earn up to $20,000 cash per year beginning on March 2 from the clip program. By 2010, schools across the nation had earned more than $320 million, the website said. Published: Nov. 2, 2018, 5 p.m.